The modern world that we live in today was, in many ways, founded on the visions of the Ancient Greek philosophers. Pythagorus, Socrates, and Plato, among other ancient greeks, provided the intellectual foundation for modern society by getting at the root of what drives the minds of people. For example, as a result of their work, we have a fundamental notion on logic, called the Socratic Method, that is still used in courtrooms thousands of years later. We were given a foundation for modern medical science called the Hippocratic Oath. Plato’s Republic provided the foundation of modern republican government. During the European renaissance a movement towards Enlightenment took shape. Centered within the United States of America, Ancient Greek ideas seeded the most iconic designs of government ever created. During the same period of time, European chemists would scientifically confirm another Ancient Greek idea – the atom. It took over 2000 years to confirm the existence of atoms. It also took 2000 years to re-create a pure concept of government originated by Ancient Greek philosophers. The Ancient Greeks seeded civilization with ideas that have since grown into massive symbols of the modern world. However there remains another Ancient Greek concept, that remains unconfirmed and mostly forgotten. And Plato was absolutely convinced of it. Socrates and Plato named it the Theory of Forms. The theory advocates for the existence, and indeed, supremacy of non-physical reality. They hypothesized that the objects we perceive as physical [World of Substance] are just shadows of the invisible World of Forms. 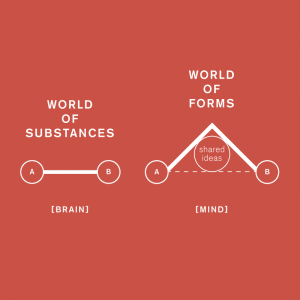 Their Theory of Forms lead to the development of ‘dualism’, stating that the brain and mind were different entities inhabiting different realms in the universe. However, there has never been a clear medium to elaborate the mechanism of energy exchange between non-physical and physical; between thought and matter, and between forms and substance. I believe that it can be accomplished by synthesizing the laws of physics and the laws of thought, into a single set of laws. It will reveal the universal laws of metaphysics that govern symbols within a hyper-dimensional space. It will finally answer the question; what does matter itself symbolize? For example, we know that protons, neutrons, electrons, and photons work together to create matter in our universe, but why these exact components? And why do they work together? What is their guiding philosophy? Physics has a great collection of practical solutions (Thermodynamics, QED, General Relativity, etc. ), but they need to be unified under the common umbrella provided by the 5 relationship patterns. And since the relationship patterns also explain the structure of thought, the patterns can unite thought and matter into a single set of meta-physics that transcends everything. Why is Change depicted as unequal to Growth? What would happen if you added “Velocity” to the above equation?